The essay offers an Atlantic reading of Thomas Hobbes’ Leviathan and John Locke’s Second Treatise of Government based on the spatial concepts of “Land” and “Sea”. «Land» is considered as the spatial principle of a terracentric conception of politics, in which politics is viewed as static, and order exists only when conflict is neutralized. «Sea», on the contrary, is the spatial principle of a maritime conception of politics, in which politics is viewed as fluid, and order is shaped in an endless, changing, and conflicting movement of powers and agents. From this perspective, modern sovereignty emerges as a process of reterritorialization of politics. In the following pages, I will venture in an Atlantic reading of Thomas Hobbes’ Leviathan and John Locke’s Second Treatise of Government. For this goal, I will use the spatial concepts of “Land” and “Sea”, as examples of two modern political logics. «Land» will be considered as the spatial principle of a terracentric conception of politics, in which politics is viewed as static, and order exists only when conflict is neutralized. «Sea», on the contrary, as the spatial principle of a maritime conception of politics, in which politics is viewed as fluid, and order is shaped in an endless, changing, and conflicting movement of powers and agents. To better understand the spatial implications of these two competing modern visions of politics, we can preliminary look at two very famous and coeval XVII century Dutch world maps, both entitled Nova Totius Terrarum Orbis Geographica ac Hydrographica Tabula and created, as their title suggests, with the revolutionary ambition of producing a «new map of the whole earth», a new representation of the world, of its «land» and of its «sea». One is the 1639 planisphere by Claes Janszoon Visscher’s (also known as “Piscator”), one of the most prominent and celebrated cartographers of the XVII century. Here, the Atlantic Ocean is not represented in the traditional ptolemaic style as the end of the world, the western edge of a world which is essentially European and terrestrial. It is on the contrary the very core of the map, the hub of the incredibly wide network of communication that has become the world. In addition, Europe – often represented in the medieval and early modern cartography as a queen ruling over the known world – has been reduced to a peripheral and quite small portion of this transatlantic world linked together and dominated by the sea. To be honest, Piscator’s map was less new than what its title suggests, since it was based on the model of the truly innovative 1570 Ortelius’ Orbis Terrarum. However, its title expresses the complete awareness of this new and modern representation of the earth and of the complexity of a world that has suddenly become «atlantic». The same is true for the other «Nova Totius Terrarum Orbis», created in 1630 by Hendrik Hondius. Here, the earth is clearly divided into two worlds, the old and the new, confronting each other as «equals». Thanks to the incorporation of the ancient oriental enemy into the old world, Europe is again big and strong: a great power on earth. Most importantly, the centrality of the Atlantic Ocean has disappeared, split and shadowed by the two impressive terrestrial spaces of Europe and the colonial world. Now, from a spatial perspective, modern theory of sovereignty can be considered a victory of Hondius’ conception of the world over Ortelius’ (and Piscator’s), the titanic effort of European political thought to contain and supersede the sensation of «displacement», or, in Deleuze and Guattari’s words, the «deterritorialization» of politics caused by the disturbing and uncanny «discovery» of politics’ natural movement. Two fundamental theoretical strategies characterize this process of reterritorialization of politics. The first, and most famous, is contractualism, the revolutionary idea that politics is the artificial product of free agreement among equals, able to transform a naturally wild and disordered world in a political space populated by sovereign states. The other strategy, which constitutes Locke’s most original spatial contribution to modern political theory, is the division of the world into two qualitatively different political spaces, each one governed by its own logic. The first is the wild and conflicting space of the colonial world, where disobedience and disturbance are (potentially) an immanent condition of politics, and power operates in the form of the government over an unstable and conflicting society. The second is the ordered and civilized world of the European system of sovereign states, where politics is supposed to be artificially stabilized and disobedience is transformed in the extraordinary event of revolution. Recent historiography has shown how English Civil Wars – the historical background of the fathers of modern theory of sovereignty – were more than national or English, involving in one single theatre of confrontations the new territories of the Americas and the Caribbean. Similarly, great attention has been given to Locke’s interest in England’s colonization of America, underlying the deep existing connection between liberalism and colonialism. However, Hobbes’ political biography is itself in many ways an Atlantic life as well. Since 1619, he was intimately involved in the affairs of the Virginia and Somers Islands (Bermuda) Companies on behalf of his patron, Lord Cavendish, and he was assigned by the Virginia Company to administrative jobs, such as answering letters of complaint from settlers, formally becoming one of its shareholders in 1622 [Aravamudan 2009; Jessen 2012]. Refractions of this Atlantic experience, though rare, can be found, such as in the frontispiece of De Cive. Here, Libertas (liberty) takes the form of a poor, sickly, and nasty Algonquian warrior who is confronted with Imperium (political power) in the form a (European) queen with sword and scales. This image suggests the precariousness of natural liberty and the necessity of abandoning it, but it equally represents the uncertain and precarious exercise of Imperium caused by the wild irruption of liberty in human relations. State sovereignty, we know, will be Hobbes’ answer to this problem. It may peradventure be thought there was never such a time nor condition of war as this,; and I believe it was never generally so, over all the world: but there are many places where they live so now. For the savage people in many places of America, except the government of small families, the concord whereof dependeth on natural lust, have no government at all, and live at this day in that brutish manner, as I said before. Howsoever, it may be perceived what manner of life there would be, where there were no common power to fear, by the manner of life which men that have formerly lived under a peaceful government use to degenerate into a civil war . In such condition there is no place for industry, because the fruit thereof is uncertain: and consequently no culture of the earth; no navigation, nor use of the commodities that may be imported by sea; no commodious building; no instruments of moving and removing such things as require much force; no knowledge of the face of the earth; no account of time; no arts; no letters; no society; and which is worst of all, continual fear, and danger of violent death; and the life of man, solitary, poor, nasty, brutish, and short . Although the «importation of that which may be had abroad, either by Exchange, or by just Warre, or by Labour» is for him an essential part of the «Nutrition and Procreation of a Common-wealth» , the «immoderate greatnesse» of some of «the great number of Corporations» that operate in the colonial trade – their growing independence and power – can be a serious cause of «infirmity of a Common-wealth», «like wormes in the entrayles of a natural man» . Only the «art» of law and state sovereignty can make these corporations and their business different from other «criminal» maritime activities, such as piracy, mutiny, and all other forms of resistance to and within colonial settlements. What makes them legitimate is, in other words, their «incorporation» within the state (the model being, of course, the system of royal charters). State sovereignty is then the condition of possibility of maritime capitalist development and, more generally, the only way to create order in a world that has become Atlantic (intended here as the spatial epitome of the wider commercial and colonial routes of rising global capitalism). In spatial terms, we know from the frontispiece of Leviathan that sovereignty is ultimately a border, the artificial decision to trace a line between two groups of individuals or, in other words, the perimeter that defines and makes possible the existence of one people and its peaceful cohabitation [Bredekamp 1999; Bertozzi 2007]. Although based on the model of the European system of international relations, this logic operates on a planetary scale, making the whole world a space entirely populated by sovereign states. Of course, Hobbes is well aware of the difficulties of universally applying contractualism. In fact, he distinguishes between «sovereignty by institution» (created by agreement) and «sovereignty by acquisition» (created by the imposition of force, through conquest). However, according to Hobbes, these different origins do not make the two forms of sovereignty qualitatively different. «Rights and consequences» are identical: both are based on «voluntary servitude», since it is not victory that gives the right to the conqueror over the conquered, but the «pact» following the conquest with which the conquered consigns and submits to the conqueror, acknowledging the power of the conqueror and authorizing all his actions to keep his life in return. And in case the master [the sovereign by acquisition], if he [the colonized] refuse, kill him, or cast him into bonds, or otherwise punish him for his disobedience, he is himself the author of the same, and cannot accuse him of injury . After the pact, the multiplicity of (public and private) actors and centers of power that freely live and circulate in the new global political space – e.g., companies, colonies, and charters – are phagocytized by the State, reabsorbed within its terracentric logics as external projections of its sovereignty. They continue to exist, but they are no longer a source of instability for order. They are now what Hobbes calls «subject systems», «parts» of the Commonwealth, «body politics» subordinated to the State: «The variety of bodies», Hobbes explains in chapter XXII of Leviathan, «is almost infinite: for they are not only distinguished by the several affairs for which they are constituted, wherein there is an unspeakable diversity; but also by the times, places, and numbers, subject to many limitations» . One typical example of these numerous subject systems is «the government of a province», where the word «province» means for Hobbes «a charge or care of business, which he whose it is committeth to another man to be administered for and under him; and therefore when in one commonwealth there be diverse countries that have their laws distinct one from another, or are far distant in place, the administration of the government being committed to diverse persons, those countries where the sovereign is not resident, but governs by commission, are called provinces» . This is also the case for two specific forms of province typical of the New World, plantations and colonies, defined by Hobbes as «numbers of men sent out from the Common-wealth, under a Conductor, or Governour, to inhabit a Forraign Country, either formerly voyd of Inhabitants, or made voyd then, by warre», whose rights and authority «dependeth wholly on their License, or Letters, by which their Sovereign authorized them to Plant»; or also as «Procreation, or Children of a Commonwealth» , because they operate as a subordinate function of (state) sovereignty. Under the shadow of Leviathan, the Atlantic political space is governed by one single political logic, the (European) logic of state sovereignty. In cartographic terms, it is as if, in the very moment they are created, the borders of European sovereign states, and their capacity to neutralize the intrinsically political and plural materiality of society, extend themselves outside their territorial limits through the functioning of sovereign extraterritorial articulations (both private and public). As a consequence, Sea returns to political irrelevancy, a mere geographical element in a world made up of Land, where the natural fluidity and instability of society has finally been neutralized. Though governments can originally have no other rise than that before mentioned, nor polities be founded on any thing but the consent of the people; yet such have been the disorders ambition has filled the world with, that in the noise of war, which makes so great a part of the history of mankind, this consent is little taken notice of: and therefore many have mistaken the force of arms for the consent of the people, and reckon conquest as one of the originals of government . But conquest is as far from setting up any government, as demolishing an house is from building a new one in the place. Indeed, it often makes way for a new frame of a common-wealth, by destroying the former; but, without the consent of the people, can never erect a new one . The first step necessary in moving from ought to be to create a functioning state sovereignty, is precisely the dismantlement of Hobbes’ unitarian spatial logic, his de facto conceptual indifference between sovereignty by institution and sovereignty by acquisition – we could say between state and colonial sovereignty. 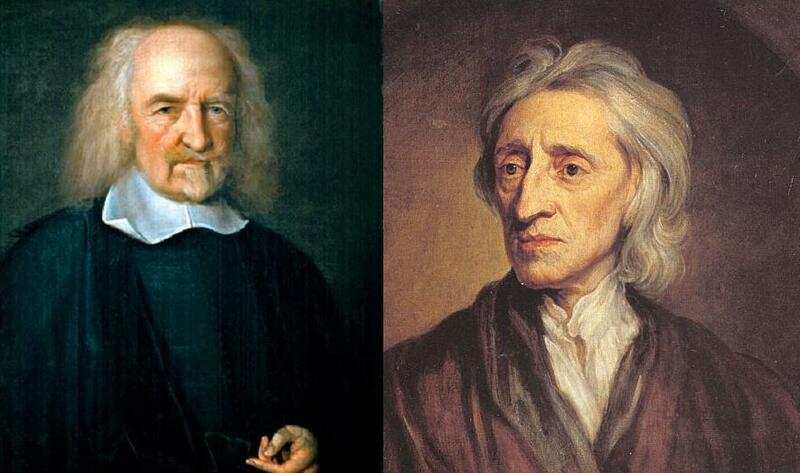 According to Locke, Hobbes’ argument is inconsistent: even if one admits that the conquered consensually submit to the conqueror, one would still have to consider «whether promises extorted by force, without right, can be thought of as consent, and how far they bind» since «the law of nature […] cannot oblige me by the violation of her rules: such is the extorting any thing from me by force». His answer is obviously negative: «the government of a conqueror, imposed by force on the subdued, against whom he had no right of war […] has no obligation upon them» . In the colonial context, where power is the result of a conquest, there is then no voluntary giving up of man’s natural rights. In fact, «whatsoever another gets from me by force, I still retain the right of, and he is obliged presently to restore» . Sovereign power depends then exclusively on the conqueror’s ability to force, «with a sword at their breasts», the conquered «to stoop to his conditions, and submit to such a government as he pleases to afford them». Nevertheless, this «right of sovereignty» falls «as soon as god shall give those under their subjection courage and opportunity» to throw off their yoke . However, Locke makes clear that this recognition of the precariousness of sovereignty in colonial contexts is «the best fence against rebellion, and the most probable means to hinder it» in state contexts : historical evidence, he explains, demonstrates that «the people generally ill treated and contrary to right» that «are made miserable», are ready «upon any occasion to ease themselves of a burden that sits heavy upon them», since «the will of man [is] inwardly obstinate, rebellious, and averse from all obedience» . To make (European) men obedient and thus renounce their natural inclination to disobedience, it is therefore necessary that (European) political power is considered a space with guaranteed exceptional conditions of security and protection, as in the case of the newborn government by consent emerged in England at the end of the civil wars. The invention of the colonial difference serves this goal: modern theory of sovereignty needs the diversity of the new world as a place where all the vices of the old world – or, more precisely, all the vices that the old humanity has discovered with the «discovery» of the new world – can be externalized and localized. Mirrored in the colonial world, Europe (the European system of sovereign states) can become the political space of an exception in human history that, because of its exceptional capacity to secure and protect man’s vital needs, can require exceptional conditions of obedience: voluntary servitude (what is needed to stabilize politics). This does not mean that colonial power is illegitimate per se. On the contrary, the legitimate (European) aspiration to acquire and defend property – to be intended in the double meaning of land and human beings – in the naturally and immanently turbulent territories of the new world makes in some ways necessary the overt and «despotic» exercise of power. However, the exercise of this particular form of sovereign (i.e., legitimate) power is now «limited» to the wild and conflicting space of the colonial world. There cannot be a clearer demonstration of anything than several nations of the Americans are of this, who are rich in land and poor in all the comforts of life; whim nature, having furnished as liberally as any other people with the materials of plenty, i.e., a fruitful soil, apt to produce in abundance what might serve for food, raiment, and delight; yet, for want of improving it by labour, have not one hundredth part of the conveniences we enjoy, and a king of a large and fruitful territory there feeds, lodges, and is clad worse than a day labourer in England . However, the primacy of the European state needs and presupposes its continuing mirroring in the colonial world. It does not really exist without this other political space. Hobbes T. (1651) 1839-45, The English Works of Thomas Hobbes of Malmesbury (coll. and ed. by W. Molesworth), London: Bohn. Aravamudan S. 2009, Hobbes and America, in D. Carey, L. Festa (eds.) 2009, The Postcolonial Enlightenment: Eighteenth-century Colonialism and Postcolonial Theory, Oxford: Oxford University Press, 37-70. Bertozzi M. 2007, Thomas Hobbes. L’enigma del Leviatano (1983). Un'analisi della storia delle immagini del Leviathan, «Storicamente», 3, no. 12. DOI:10.1473/stor399. Bredekamp H. 1999, Thomas Hobbes visuelle Strategien: Der Leviathan: Urbild des modernen Staates (Acta humaniora), Berlin: Akademie Verlag. Galli C. 2011, Spazi politici, Bologna: Il Mulino. Gerbi A. 1973, The dispute of the New World: the history of a polemic, 1750-1900, Pittsburgh: University of Pittsburgh Press. Kupperman K.O. (ed.) 1995, America in European Consciousness, 1493-1750, Williamsburg: Omohundro Institute of Early American History and Culture. Kupperman K.O. 2000, Indians & English: Facing Off in Early America, Ithaca: Cornell University Press. Jessen M.H. 2012, The State of the Company, «Journal of Intellectual History and Political Thought», 1: 56-85. Laudani R. 2011, Disobbedienza, Bologna: Il Mulino. 1. Hobbes 1651 [1839-45], vol. III, 112. 5. Hobbes (1651) 1839-45, vol. III, 191. 9. Locke 1689, cap. XVI, § 175. 14. Ibid., cap. XIX, § 226. 15. Ibid., cap. XI, § 135. 16. Ibid., cap. V, § 49.